ANIMAIA: Novels with a Message - Do they Sell? Novels with a Message - Do they Sell? Read any writing or agent blog and the advice not to write fiction about 'causes' is relatively widespread. However, like much proscriptive writing advice, the proof is in the implementation. True, few people want to read didactic, lecturing and unsubtle stories about campaigns and causes in a novel -- from environmental activism to religion or political activism -- unless they choose to be harangued in this way. However, sub-texts on such themes in fiction can work well as long as the story is well-written and heavy-handed finger shaking is not a primary theme. 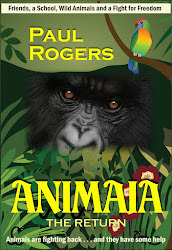 ANIMAIA has an environmental and animal rights theme, but it is somewhat subsumed in the grand story of one teen's personal journey and a group of teenagers struggling with life, school, and changes in society and personal and international security . . . not to mention each other! And the best books of this type, in my view, usually present ambivalent themes and challenges to the obvious paradigm. Working and writing in the 'grey' regions of ethical and moral dilemmas not only provides great scope for authors in developing story, but keeps readers interested -- especially young adults who are struggling with ideas and behaviours in a world that's changing rapidly.